One of my projects (number 2) took its first step into the physical world today. I now have the first pieces of the jigsaw in MDF to make a one metre tall sculpture of Vanessa Standing. Each sheet takes about one hour and twenty minutes to cut. Next I need to check that the transfer of my computer model to the laser cutter worked as it should. There were a few hiccups which Gillian Duffey resolved for me (Thank you Gillian). The transfer of my scanned model to the laser cutter input involved a couple of scaling issues. The first one was my fault as I defined the dimensions of the MDF sheet incorrectly as it did not match the physical sheet. The second was not. The laser cutter system automatically reduced the scale of my model by 1000% and had to be adjusted. There were some other issues caused by Autodesk 123D MAKE. It left gaps in some of the pieces, and in the drilled holes for the dowels that bind the sculpture together. Fortunately the former were too small to affect the cutting of the pieces, but unfortunately it did not allow the dowel holes to be anything but marked out on the pieces themselves rather than cut through. I have yet to work out what to do about this. Perhaps I will just use them as markers to position the pieces and glue them together without the dowels. Finally the edges of the cut pieces are dark brown, almost black. 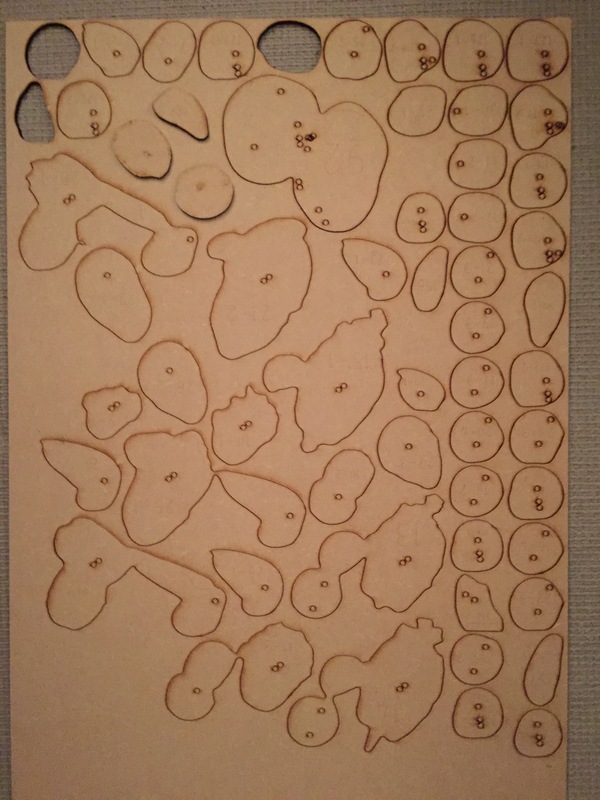 This is normal for the laser cutter when applied to MDF or wood. I did not know this before. Alex May recommends that Projection Mapping works best on a very light gray surface. I will have to consider this too. I will carry out a Projection test later and if it does not work well then I will have to spray paint the pieces before I glue them together. I can now move on to making Vanessa’s head. Or at least I will be able to do so when Gillian cuts the second already prepared sheet. Hopefully this will be ready on Wednesday. I also made progress with my other project (number 1). Tim Harrison in the Digital Media Department helped me to see which were the best recorder settings from the tests he recommended previously, which I carried out last week. He also split the recordings into two short pieces on two SD Cards ready for my test with the SD Card Readers attached to the Arduino (Thank you Tim). It was important to remember that whilst the recordings were made in MAV format (the best option) the SD Cards needed to be in MP3 as that is what is expected by the pre-programmed Arduino from Bare Conductive. I am now ready to test a mini canvas using Conductive Paint connected to the Arduino and the SD Card Readers with some of Vanessa’s recordings. I have also given Vanessa some directions insofar as the type of recording required, as we now have almost enough reflective material. 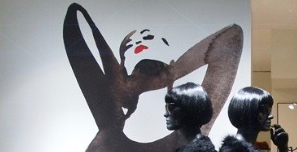 We need some recordings about herself and others relating her feelings towards various parts of her body being touched in the full sized minimalist painting. Vanessa is now working on this for our next studio session on 19 November. Overall a very successful day. PS The dowel holes came out OK the following day, and the dowel passed through them easily. So now I only have to see if they line up properly. Gillian emailed and the next sheet with the rest of the parts to make Vanessa’s head are ready to collect tomorrow. So I can now assemble her head and see whether it has all worked out as planned. 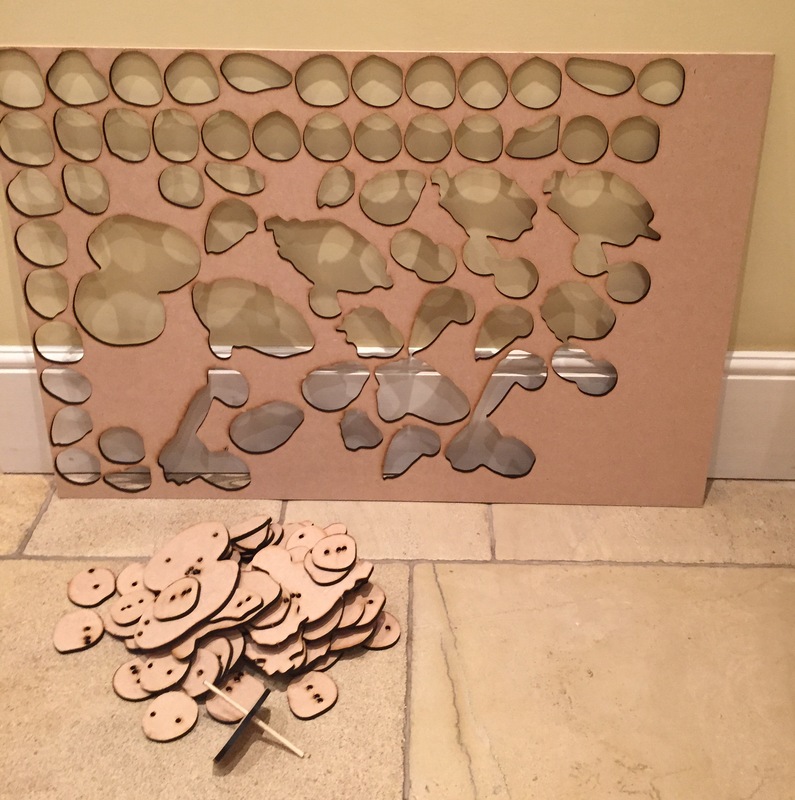 Only 5 more sheets to go and I will have all 244 parts ready to assemble into the full one metre high sculpture. This entry was posted in Uncategorized on November 9, 2015 by terencemquinn91. Yesterday I met June Mendoza at a party. I had the opportunity to talk to her for 10 minutes before she moved on to speak to our host. She had a narrow escape as I would have kept going for longer. But I guess she saw that coming!! I must admit that I knew June was going to be there as I had seen the guest list. 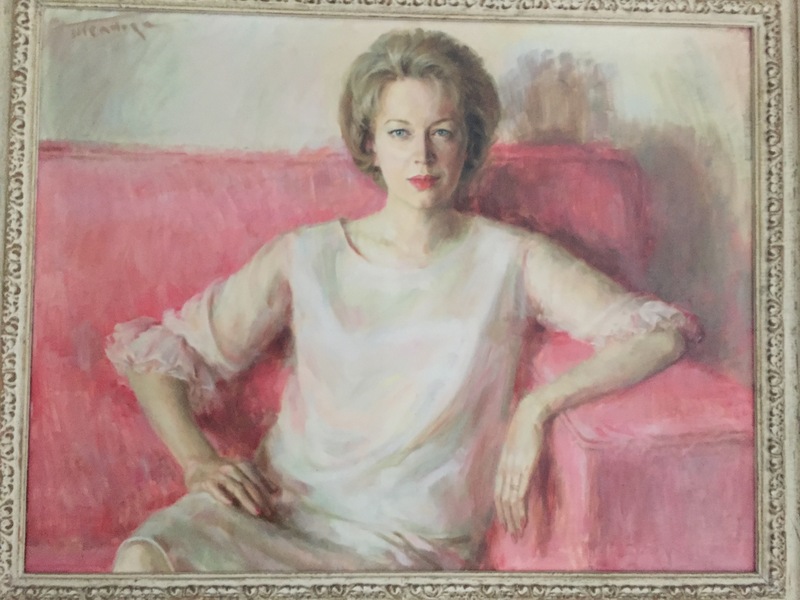 She had also painted the portrait shown here which I had seen many times, of our host 50 years ago on the occasion of her 40th birthday. Now my lovely mother-in-law is ninety (well not quite, not until 11th Nov). June has painted many famous faces. She works mainly in oils and has not used digital. If others work from photographs she is of the view that the exercise is pointless “May as well stick to the photo”. 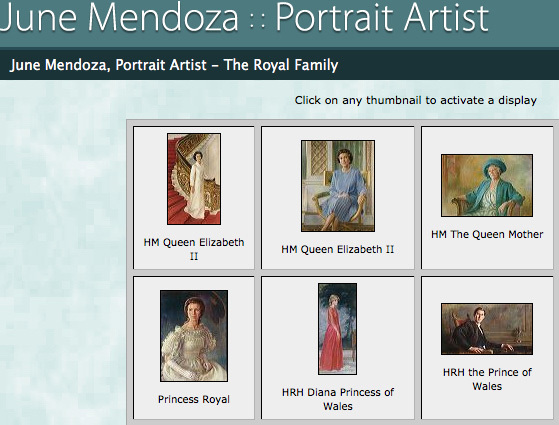 She takes a lot of care choosing the right clothes for the portrait even going through their wardrobes beforehand – including Princess Diana’s. “Taking note of their expressions and body language to bring out their character” is important. We discussed Stephen Farthing’s assertion that the difference between drawn art and computer art is “truth” (see my earlier blog). I was seeking reassurance that my intended digitally inspired works were truthful. June said that what you see and observe is “truth”, and “if the subject moves, stop”. She advised me to spend 3 weeks in a cafe observing and drawing the character’s I saw there. And then she was off. I was left reassured that as long as I observed well and drew from life, that my work could be truthful. That at least works for my first two projects. Not sure that it does for the others, unless I take my scans into the studio and draw over them from the model in front of me in the same position. Will I ever get to that level of proficiency with the graphics tablet and pen? To even attempt that I would also have to get a very expensive Wacom Cintiq Companion 2, which allows you to work independently from your main computer. Sadly I cannot afford one! This entry was posted in Uncategorized on November 7, 2015 by terencemquinn91. Antony Gormley’s iconic sculptures have until two years ago been made from plaster casts of his own body. Not now. Of late, he uses a scanner and a computer program. 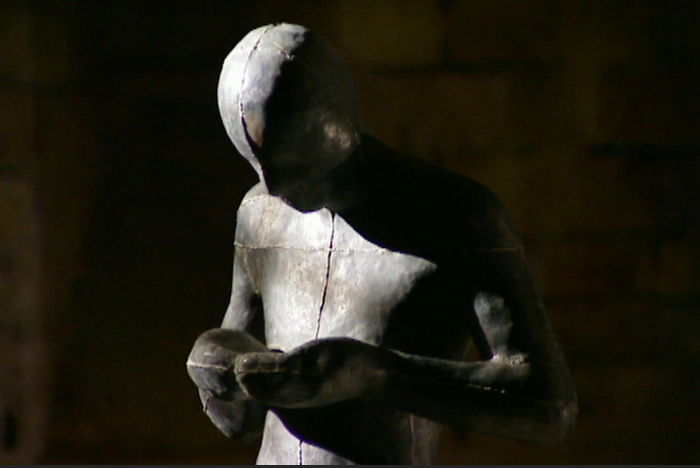 I only found out this week when I saw the BBC Arts program ‘Antony Gormley: Being Human’ (BBC Imagine – Series 28-2, 4 November 2015, An interview with Alan Yentob). I thought that I was the first to try this approach. But perhaps being second (or so?) is not too bad. I am heartened. Not disappointed. I feel that my approach is validated, even if it is not so new for creating sculptures of the human form. However, Antony Gormley’s set up using an infra-red scanner is VERY expensive. My methods use only recently available technology and devices that whilst not cheap, put the possibility of using a similar approach into the hands of the ordinary mortal. 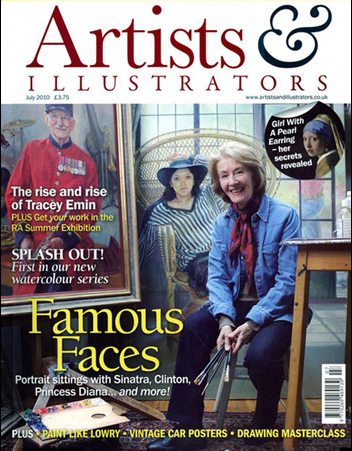 So regular artists’ with less deep pockets can explore this approach in their practice. And that is new. So I am happy that I have at least introduced some innovation into this piece of work. For Project 2, I made files of these scans for input to the Camberwell Laser Cutter and have checked that these are acceptable. On Monday, I will be testing them out, using a couple of A1 sized sheets of MDF to see whether the process works, before I go ahead and produce the whole sculpture. I will be doing my final scans on 19 November, so I expect to produce the full sculpture during next term, ready for the MAVA Fine Art Digital Exhibition in July. I also now have all the ingredients I need for Project 1: Over an hour of recordings made by Vanessa, both in the studio and at home; Photographs and Scans of her in various poses; the BareConductive Arduino Pre-programmed for playing MP3 clips; some Conductive Paint: and a couple of huge life sized canvasses (6 x 4 feet). There will be more recording and scans and it will be very interesting to review them all and decide which to use. On Monday I will work in the Camberwell Sound Studio to study my test recordings and to cut a few test SD cards for the Micro Card Readers. These will be attached to the Arduino at the rear of the canvas, connected by wires through the canvas to the Conductive areas on the Painting. I intend to visit BareConductive in London to learn more about how to use their products in my project. I will then conduct a concept test at home, before turning my attention next term to actually putting brush to canvas. It is a very satisfying feeling to see my first two projects, so long in the research and planning stages, at last starting to take shape and becoming a physical reality. Antony Gormley was however Following in the Footsteps of our very own trailblazer, Mr Jonathan Kearney. “Hi Terry. I am aware of the type of scanner Antony Gormley uses. I used one in an art project about 8 years ago. It was extremely challenging to use and in the end we had no choice but to pay someone to stitch together the actual scans of the head as it was a nightmare to piece it all together. The resolution was good but the other problem was that the scanner was the size of a large suitcase and weighed about 25kg altogether with its own tripod!” ( Email, Jonathan Kearney, 7 November 2015). This entry was posted in Uncategorized on November 6, 2015 by terencemquinn91. My aims are to explore how far digital methods can extend the artistic presentation of the life model beyond traditional life drawing and to demonstrate this by producing distinctive and differentiated artworks in both physical and digital form. To have understood the attitudes of artists towards the adoption of new technology in their practice and how that enables them to produce new valued works of artistic expression. To name the contemporary artists I wish to be judged against. To produce distinctive and differentiated works of which I am proud and that are well received in the fine art community. expression for both approaches. However, as my own taste is for a realistic or semi-realistic outcome, my research and works will necessarily lean in this direction. An early example of using perspective in painting can be seen in the work of Jan Van Eyck, a Netherlandish painter. The Arnolfini Portrait is an oil painting on an oak panel dated 1434, painted in Brugge and displayed in the National Gallery, London. It is unusual for its time in its use of orthogonal perspective, that is the use of imaginary lines disappearing to the vanishing point. This gives a sense of depth to the work even in the faces of the man and woman in the picture as well as in the room they occupy. In order to gain perspective Van Gogh employed the use of a wooden Perspective Frame which he wrote about in his letters, and justified its use by saying that earlier masters had employed it (VanGoghReproductions.com, Perspective Frame). J.M.W. Turner used a different device. David Blaney Brown’s book J.M.W. Turner: Sketchbooks, Drawings and Watercolours (2012, Penguin) refers to Turner’s own ‘Diagram and Notes Relating to Perspective’ in which he describes a clapperboard type device which he used for the same purpose. James Alliban’s installation ‘BiPolar’ (1992), uses a Kinect and a microprocessor to detect and manipulate a persons image in a mirror. 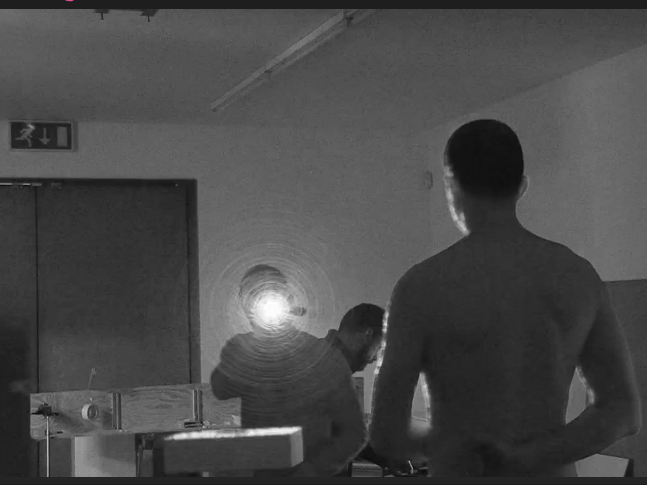 A person’s reflection is distorted by the sounds in the room, including a haunting track of his chosen music, and the proximity of the person’s body or body parts. Spikes all over the body project outward towards the person looking into the mirror, at various rates and intensity dependent upon the closeness of the person to the mirror and the beat and rhythm of the music. I am interested in exploring the niche of artistic representation of the life model because most work of this type remains in the domain of the traditional artist. An artist draws in pastel or charcoal, paints in water colours or oils, or sculpts in clay or stone. The model sits still and silent in a studio, and the viewer remains a distant observer of the finished piece. Excluding sculpture, the drawing or painting still remains a two dimensional image from a fixed viewpoint. In all cases the model is a still object in the finished piece and not an integral participant in it. Personality can only be suggested, because the model has no voice and no movement. The viewer of a drawing or painting cannot see the three dimensional reality observed by the artist, only the suggestion of it. This also applies to both analogue and digital photography. I can see an opportunity to change this by using more established digital techniques not usually employed in the artistic representation of the life model, and by deploying recent advances in hardware and software. To achieve my aim of seeing how far digital methods can extend the artistic presentation of the life model beyond what you usually find today, I will start with one of my existing traditional life drawings in charcoal and contrast that with other pieces or installations that progressively extend into the digital arena. I would like to find an approach that nobody has used before and which perhaps may be adopted or adapted by other digitally inquisitive artists. If there are examples I can borrow and change for my purpose I will do so, if to start from scratch is impossible in the two year timeframe of my MA. This approach is supported by a quotation made by Jonathan Letham ‘’All art exists in a continuum of borrowing’’ from an article he wrote in Harpers Magazine, February 2007 ‘The Ecstasy of Influence – a Plagiarism’ and presented at a recent lecture I attended at the V&A on the topic ‘Friction and Fiction: IP, Copyright and Digital Futures’ given by a keynote speaker Dr JR Carpenter (Writing on the Cusp of Becoming Something Else, 26 September 2015). advantage of technology changes, in particular those who have focused on work representing the human form. I will examine how artists are currently deploying the latest technologies in my artistic territory, and examine the possibilities that are opening up today. In particular I will look at the work of some current day artists who have been immersed in more traditional practice but are now leading the way in ‘digital art’. I aim to conduct some of this research through interview with the artists concerned (but I understand the opportunity to do so may be limited). I will document my research through the use of the computer application ‘Zotero’ and through my WordPress blogs. Project 2 Painting the sculpture with light and music using projection mapping. 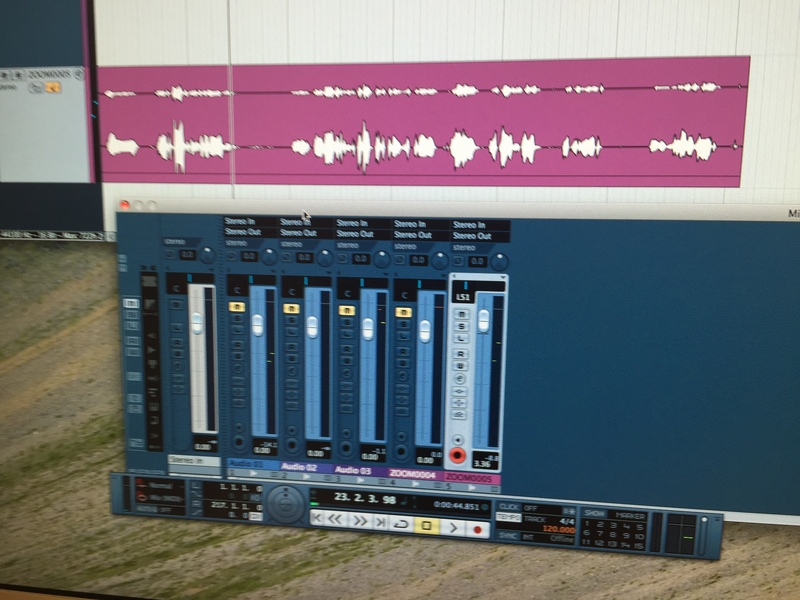 Technical Test – 3D Scanning, Voice Recording and Test Editing with Digital Media Dept. Decide which Project (or both) I am going to prepare for the end of year exhibition. If two, prioritise one over the other. The references for this paper are included in the text. Below is a list of references (that I expect to add to) which I would like to draw upon in my research. This entry was posted in Uncategorized on November 3, 2015 by terencemquinn91.